Edmonton-area municipalities are struggling to manage increased recycling costs a year after a decision made by the Chinese government changed the industry. Government officials in China announced more than a year ago the country would no longer be the world’s dumping ground for plastic and paper as of Jan. 1, 2018. The decision was devastating news for Edmonton and surrounding municipalities that relied on China as their primary market to ship a portion of their recyclable materials from blue bins so the material could be recycled into other products. Municipalities and recycling contractors have only now started to see the impact of China’s decision. China’s ban forced Edmonton-area waste management officials to look for new international markets for cardboard and paper. But the recyclables markets in other countries have become increasingly competitive following China’s decision. “It has increased the competition across the board,” said Mike Robertson, contract manager for Edmonton’s Materials Recovery Facility. Municipalities in the Edmonton region have been forced to either ban certain items from blue bins or pay more to sort through the contents. International companies have become more selective about recyclable materials, demanding a more “clean” product from places like Edmonton, said Robertson. That means workers at Edmonton’s sorting facility now need to carefully comb through items found in blue recycling bags to ensure materials like paper and plastic do not mix. If the pile of recyclable goods becomes contaminated with another type of material, it becomes harder for Edmonton’s recycling contractor, Suez, to sell the recyclable goods to international markets. But fine-tuning the sorting process takes time and money. Labour costs and sorting times are manageable for now, said Robertson. But the increase in manpower could mean an increase in labour costs. Smaller communities outside Edmonton face a similar situation. Leduc is already in negotiations with its recycling contractor, GFL Environmental, to try to manage increasing processing costs at the sorting facility. Olson wouldn’t disclose the dollar impact to the city, citing contract privacy and ongoing negotiations. He said most municipalities in the Edmonton region face increased sorting costs as a direct result of China’s decision. GFL Environmental and Suez did not respond to repeated interview requests by CBC. Any extra recycling costs would get passed on to Leduc residents in the form of increases in their waste collection fees for recycling and garbage, Olson said. But that is a discussion for later this year, when user fees for 2020 will be part of Leduc’s budget deliberations. Spruce Grove, St. Albert and Strathcona County are also feeling the strains of China’s decision through their recycling contractor GFL, officials said. The recycling market is changing every day following China’s decision, said Christina Seidel, executive director of the Recycling Council of Alberta. “I think if municipalities want to keep the level of service that they have, they have to realize it’s going to cost them more,” she said. “That is the reality. Some of the region’s municipalities are trying to control costs by limiting what can be tossed into blue recycling bins. As a direct result of China’s decision, Strathcona County, St. Albert and Spruce Grove have within the last six months banned certain items from blue bags to keep sorting costs low. Strathcona County residents can no longer add single-use plastics like coffee cups, Styrofoam takeout containers or film plastics to their blue bags. Homeowners in St. Albert and Spruce Grove have also been told to keep those items out of their blue bags. Strathcona County and St. Albert have gone as far as refusing to pick up contaminated bags and affixing stickers that list the contaminated items onto blue bags as part of the recent changes. All plastic packaging and products have symbols with numbers on them. The numbers range from one to seven. The numbers identify the type of plastic used for the product. For people in Leduc, a ban on plastics numbered three to seven will be coming later this year to help cut down recycling costs, said Olson. But where do items such as clamshell containers that hold fruits or baked goods go if they can’t be recycled? Municipalities are asking residents to reduce and reuse as much as possible, but not all items are eligible. 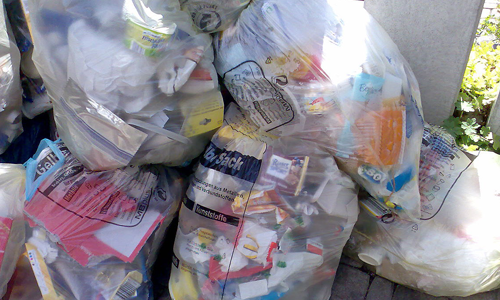 There’s a possibility that some items banned from recycling bags now end up in landfills. It will be hard to know if plastic products that were previously allowed in recycling bins are now being thrown away until a waste audit is done later this year, said Kwok. One solution to the region’s recycling woes, Seidel said, could be an extended producer responsibility (EPR) program, which makes the producer responsible for a portion of the financial costs of a product’s life cycle. Most provinces in Canada have EPR programs, though Alberta has not yet implemented one. Seidel sees EPR as something that can alleviate some financial pressures on municipalities, which are forced to spend time and money to find places to send their plastic, cardboard or paper recyclables. The provincial government would need to introduce an EPR program, something the Alberta Urban Municipalities Association (AUMA) has already started to lobby for. Seidel said municipalities should not be forced to pony up for recycling costs. “At the end of the day, it’s going to be the municipalities that realize they should not be the ones holding the bag, not just on cost but on the responsibility of making sure this material is properly handled,” she said. Seidel said the days of blue bins being catch-alls for Albertans are over.